But rejoice! A promotion and relocation to a different part of the building has breathed new life into my desire to use time at work to increase my overall health! In fact, by eating healthy and standing more, I’ve lost nearly 30 pounds. So how has my experience been with the WorkFit? In a word, enlivening. At the time of the original article I was starting to have issues with my left knee, which I attribute to my change in careers from a semi-active retail environment to a completely sedentary desk job. In addition to, and surely in part due to the weight loss, my knee problem has all but disappeared. I can’t emphasize enough the difference in how I feel at the end of my day today compared to the same time last year — it’s truly remarkable. Around the office, my WorkFit still get’s plenty of attention, especially on the rarer occasions when people catch me sitting and react like my hand is deep in the cookie jar. Honestly though, you can’t stand all day, even if you want to! In my experience, I find rotating about 2 hours standing with about 30 minutes of sitting is a pretty good ratio. Construction of the product has been terrific, with absolutely no change in the general feel of rigidity – no wiggles or squeaks whatsoever. That being said, working with the WorkFit isn’t perfect. Having this obelisk in the middle of your desk makes reaching some things a little awkward at times, and the default configuration doesn’t have a lot of room for other things you need when working. Fortunately, Ergotron hasn’t been sitting on their keisters either, and have been hard at work expanding the breadth of needs Workfit users are sure to have. 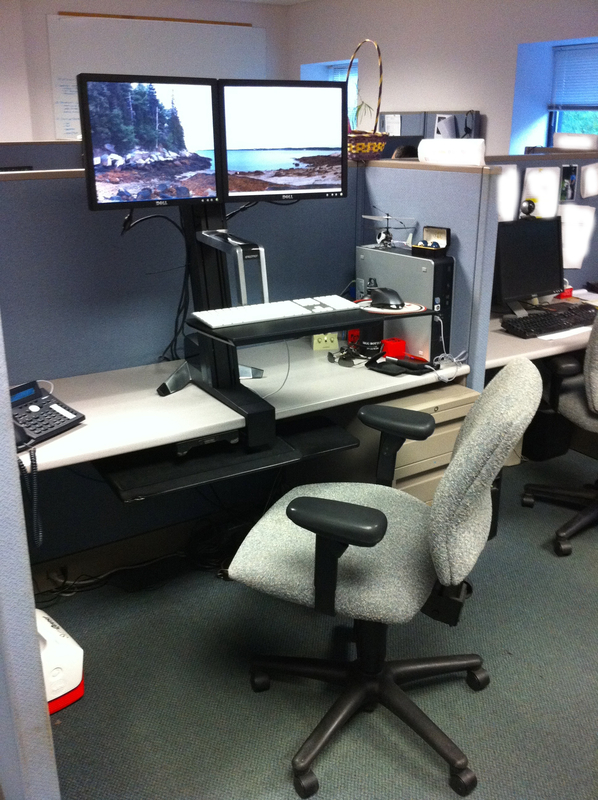 New options are available to increase work space, hold tablets, and even reconfigure the monitor mounts to accommodate additional or fewer displays.